My grandmother never made "Congri" like other Cubans did. She would always add coconut milk to , but she would also always tell me "Cubans don't make it like that". She said she learned to make it like this from some Haitian friends that lived in Cuba at the time she was there. This is not an authentic "Congri" but very similar to it, I know how to make a more authentic "Congri" but I will make it some other time. Honestly I will almost always pick my "grandmas way" over authentic, because her cooking when I make it reminds me of her and brings up child hood memories of her food and comfort. I want to preserve that and share my cooking with others and pass it to future generations of my family. 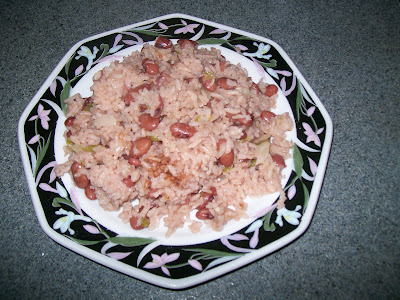 I guess this dish is an example of Haitian influence on Cuban cooking. 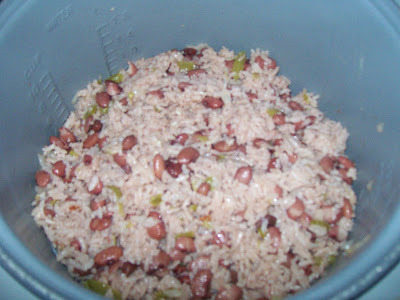 When I make the "authentic" "Congri" I will explain the whole story about "Congri" and how in Western Cuba "Moros y Christianos" done with black beans is more popular and in Eastern Cuba (El Oriente) prefers red beans and makes Congri usually instead of "Moros"
(1)Sift rice on a strainer to get rid of tiny broken grains. 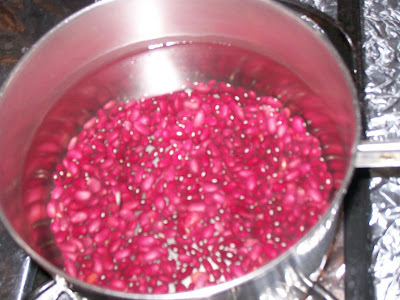 Rinse about 3 times until water runs clear swooshing and rubbing to get rid of any excess starch. 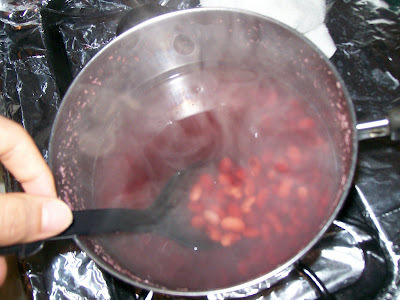 Now place back on the strainer and let it drain well leave it alone until your beans are ready for the rest. 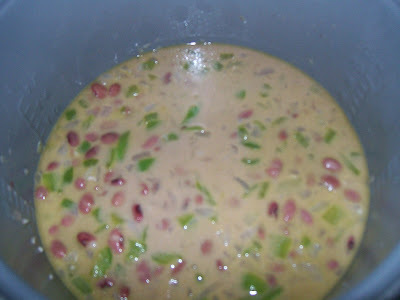 (5)Pur rice in rice cooker, add red beans, 2 cups of red bean broth, and 1 cup of coconut milk (you can freeze any leftover coconut milk use in any other dish). Set aside. 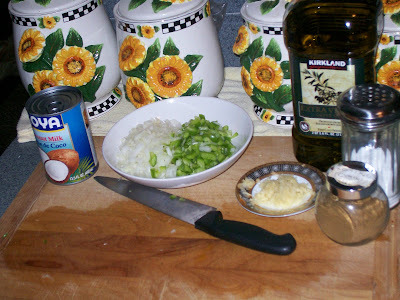 (6)Heat Coconut Oil or Lard in a frying pan on medium high or medium and then when warm enough sautee minced onions, bell peppers, and garlic until fragrant and onion is translucent (this may take like 5 minutes or more) stir every now and then. 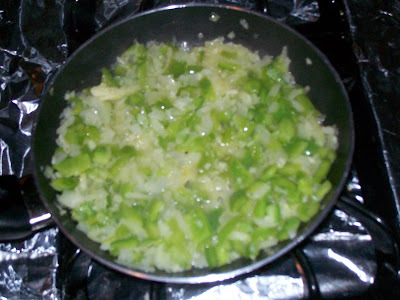 (7)Add the sauteed onion, bell pepper, and garlic mixture with oil and all to the rice and beans and stir in gently. (8)Season with salt (I used 3 teaspoons the liquid will taste salt but once it is fully cooked it will be just right, because rice absorbs lots of flavor and you gotta have enough salt to flavor rice, beans, and sofrito (sautee). 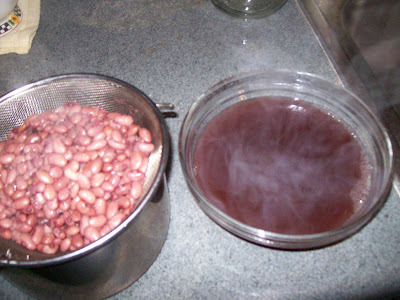 Then add ground cumin and also stir in gently I fold carefully I don't want to break any of the beans and have it release stach. (9)Cover and turn on rice cooker, when done fluff rice and everything and it's done. 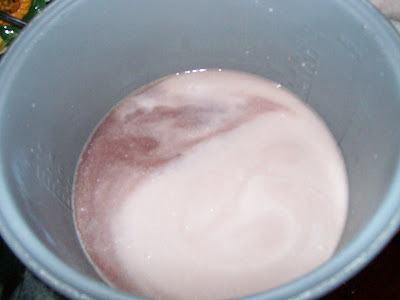 I love it the rice is a very light redish pink color because of the red bean broth and coconut milk mixture. The rice was perfect it was moist but not mooshy. It was very slightly al dente but it's suppose to be like that. If your final dish is slightly dry in your opinion then just splash a little bit of leftover bean broth fold in gently and cover for awhile it should moisten (I always get it perfect now days though ;) If it ends up to moist, simply get a paper bag, cut it place it on top and press slightly then cover for a while turn rice cooker back on and wait for like 10 minutes.